India was a Partner Country, present with two pavilions over more than 300 square metres, at the 36th Construma construction and home building exhibition at Hungexpo in April. Construma is the largest trade exhibition of the construction industry in Hungary and one of the leading exhibitions in Central and Eastern Europe. This year it occupied more than 40,000 square metres with 700 exhibitors from 17 countries. The India Pavilion was organised by the Federation of Indian Chambers of Commerce and Industry (FICCI) and the Ministry of Commerce and Industry, Government of India. The main objective of the India Pavilion was to increase market access for the Indian construction and home interior industry in the European market and to learn best practices in the construction industry. Ambassador of India to Hungary Rahul Chhabra gave a welcome speech in which he expressed his happiness that India was a Partner Country for this year’s Construma. He congratulated FICCI, which is a prominent industry association of India, for organising such an impressive participation from the world’s seventh-largest country with over 40 companies across all sectors. 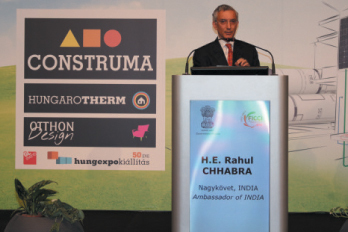 Chhabra said India and Hungary share a good rapport in their bilateral relationship. Indian investments in Hungary are of the order of USD2 billion and growing. Indian investors employ almost 10,000 people in Hungary. The ambassador said Hungarian investments in India are estimated to be USD 50 million and he would like to see this grow. Hungarian companies had expertise in the areas of focus of the Government of India, whether they be the Smart Cities programme, Clean India Programme, Digital India, Skill India or Make in India. Chhabra emphasised two important upcoming events, namely the India-Europe Business Forum to be hosted by FICCI in the last quarter of the year and the Vibrant Ceramics Expo and Summit 2017 in Gujarat from 16-19 November. He hopes Hungary will send large official and business delegations to the events. The ambassador announced the inauguration of the plant of Apollo Tyres, which is the largest green-field investment by India in Hungary. He said Prime Minister Viktor Orbán had agreed to grace the occasion and inaugurate the plant on 7 April. Also the second Ganges Danube Festival, a cultural programme which the Indian Embassy is organising in 15 Hungarian cities, would take place on 24-25 June. After the Construma opening ceremony, Chhabra visited the main pavilions including the Indian Pavilion where he cut the ribbon and Indian dancing was seen.